YOU MUST PRESENT EVIDENCE TO DEFEND YOUR INNOCENCE AND CLEAR YOUR NAME OR BE FOUND GUILTY AND FACE PUNISHMENT BY OTHER PLAYERS IN THE GAME. STRATEGISE BY PLAYING ANY JACK, QUEEN, KING OR SHAPESHIFTER FACE UP AS A WITNESS CARD TO CREATE VARIOUS EFFECT ON THE GAME! ​SHAPESHIFTERS CAN BECOME A COPY OF ANY CARD IN THE DECK OF A MATCHING COLOUR! USE THE SHAPESHIFTER GAME TOKEN DURING PLAY TO DECIDE YOUR FATE! 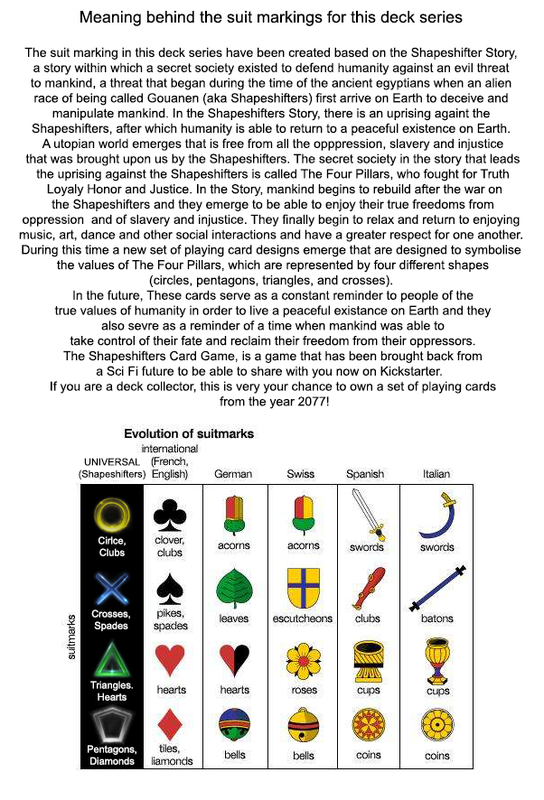 FULL RULES LEAFLET AND YOUTUBE TUTORIAL AVAILABLE BELOW PLUS A PDF DOWNLOAD OF THE FULL RULES WILL SOON BE MADE AVAILABLE FOR ALL BACKERS OF THE SHAPESHIFTER PLAYING CARD PROJECT ON KICKSTARTER! 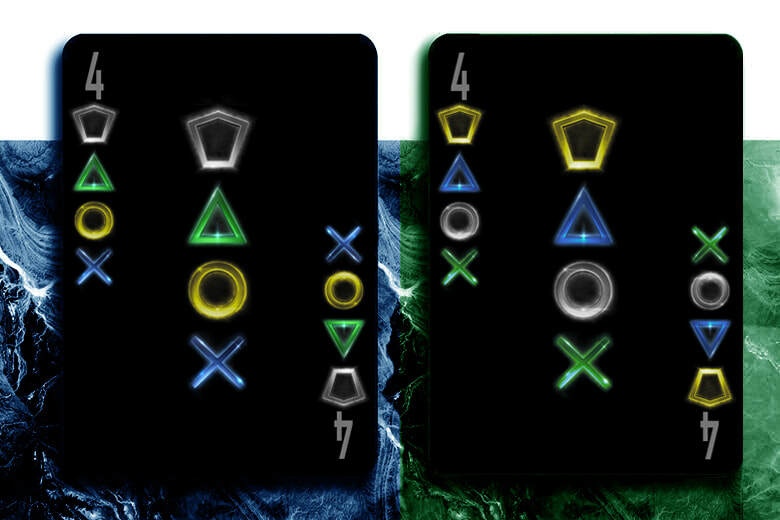 There are 3 Modes of Play when playing Shapeshifters which are, Poker Mode, Classic Mode and Story Mode. All 3 modes of play will be available as a PDF File for you download plus the Story mode is outlined for you below. (If you prefer, you can watch the basic Youtube tutorial for the Story Mode by clicking the button link above). There is deception among you....The Four Pillars has been infiltrated by one or more Shapeshifters!. An urgent gathering has been called in the great temple where a trial will commence for a number of The Four Pillars members who have been taken into custody. Each of the accused (up to 4 players) must defend their innocence by presenting evidence and providing strong witnesses to support their case to clear their name.....or be found guilty and face punishment by the other members of The Four Pillars. (With Shapeshifter Playing Cards, the suits of Clubs, Diamonds, Hearts and Spades are replaced with Circles, Pentagons, Triangle and Crosses which are called Pillars. These are valued in ascending order with Crosses being the most valuable Pillar). - There is the inclusion of 2 Shapeshifter cards that act as wild cards. When combined as a pair to form a player’s hand, Shapeshifter cards are ranked higher than a pair of aces. 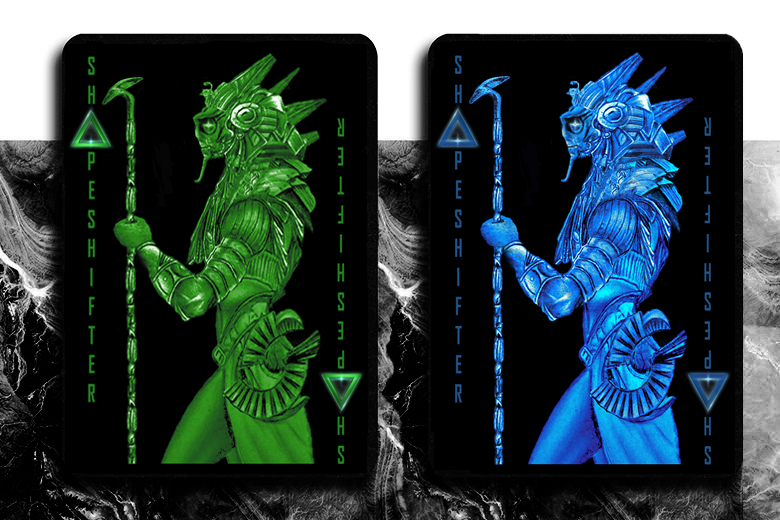 - Shapeshifter cards can become a copy of any card of a matching colour that is in play, either on the table or in a player’s hand (In a standard Shapeshifter deck containing Blue Shapeshifters, the shapes of crosses are blue and can be used to shapeshift with). - Before a game commences, each player writes either the word 'Human' or the word 'Shapeshifter' on a piece of paper and conceals it from the other players. - Players must take part in a number of Challenge Rounds which involves presenting evidence cards and witness cards to support there case. - As with Texas Hold-em Poker, a dealer button can be passed around the table in a clockwise motion to keep track of the dealer for each hand. - Just like Texas Holdem, Each player is dealt 2 cards, these are called defence cards which will be used to support a players case during play. - The second round of presenting evidence is when an additional card is placed into the game next to the 3 Jury cards for each player to build their defence with. In poker this card is called the 'Turn Card' and in Shapeshifters it is called the 'Council Card'. - The third round of presenting evidence is when a final card is placed into the game for each player to form their defence with. In poker this card is called the River Card and in Shapeshifters this card is called the 'Judgement Card'. - The Four Pillars Card - If a player has a 4 of Pentagons in their hand (which represents the 4 pillars in Shapeshifters and includes each of the four shapes printed on it), they can reveal that card at any time during their turn by placing it face up in front of them. Any player in possession of a shapeshifter card is then forced to discard it from the game. The Four Pillars Card can also be used as a 4 of any shape to make a hand with and greatly improves your chances for getting a Flush, which is refered to in Shapeshifters as a 'Foundation' (5 of any same shape). - If a player loses a hand to a player that reveals a pair of shapeshifters from their hand (must have both in their hand), all players at the table, whether they were in the hand or not, must give the winner 5 evidence tokens. - Each player starts the game with 25 evidence (represented by evidence tokens/Betting Chips/Tokens/Currency Cards, which can be worth different values as long as they can be combined to make a total of 25 evidence. 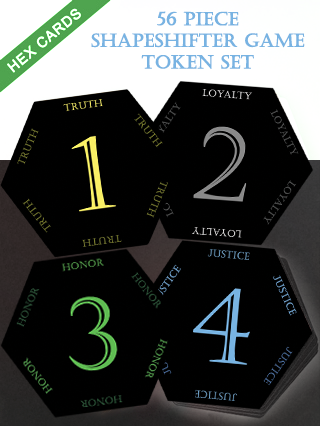 eg: If using Shapeshifter evidence tokens you start the game with 5 circles (truth tokens) valued at 1 each, 5 pentgons (loyalty tokens) valued at 2 each, 2 triangles (honour tokens) valued at 3 each and 1 cross (justice token) valued at 4 (These tokens can also be represented by regular poker chips in different colours, any other form of tokens, or players can use other optional shapeshifter tokens to play with (To be available seperately from online store). - At the beginning of each challenge round, the player to the left of the dealer must put forward 1 evidence token, at which point the next player to the left has the option to either, present 1 or more evidence tokens, play a witness card, or stand down from the challenge and discard their hand. - Each player in a challenge round has the option to 'Question' another players evidence by matching the amount of evidence that has been presented by another player....or they can 'Counter' the evidence by presenting a higher amount of evidence into the case. - After the Jury, Council and Judgement cards have been placed into the game, players can combine any of their defence cards with the jury cards, council card, judgment card and any of their witness cards to make the best 5 card defence with. - The winner of a challenge round wins all the evidence tokens presented into the case for that round. - To win a trial you have to be the only remaining player to have evidence tokens still in your possession. - There are a minimum of 3 trails to determine the winner of the game. - If a player runs out of evidence to play during a trial then they are found guilty and must face some form of punishment by the other players in the game (or they can plead mercy and lose an additional game point. If the guilty player wrote 'Shapeshifter' on their blank piece of paper at the start of the game, they are able to escape and avoid any form of punishment (If however, a player wins a trial and they wrote Shapeshifter, they only gain 1 game point for that trial). - If a player wins a trial and they wrote Human, they gain 3 game points but if they are found guilty during a trial and they wrote human they not only still face punishment while being wrongly convicted of being a shapeshifter, but also they lose 1 game point for that trial. - Hand rankings are the same as poker with the exception that a pair of Shapeshifters is ranked higher than a pair of aces. Shapeshifters can not be used to exceed regulation poker hand rankings eg: you can not make 5 of the same card such as 5 aces etc by using Shapeshifter cards to beat four of a kind which is a regulation poker hand. 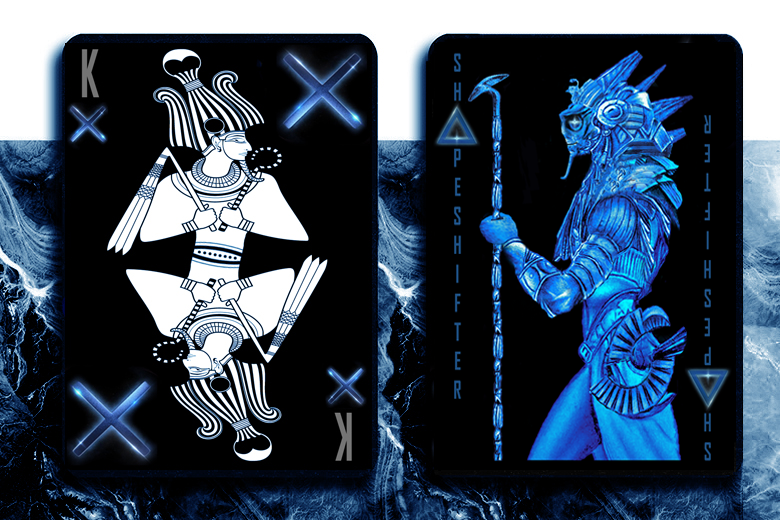 (The rules for the bonus shapeshifter card, that is available in the Dendera Zodiac Deck, will be obtainable by those who can crack the codes hidden within the decks design to unlock hidden locations, webpages etc to view and acquire all the secret rewards hidden within the Dendera Zodiac Deck).